Habitat: St John’s Wort grows in temperate and subtropical regions of Europe, North America and Asia. It can be found on uncultivated grounds, woods, hedges, roadsides, and meadows. Description: St John’s Wort is a herbaceous, perennial plant, with creeping rhizome and erect stems, branched near the top. It can grow up to 1 meter in height. Leaves are oblong, yellow-green, oppositely arranged along the stem. They have pellucid dots which can be seen when held up to the light. Flowers are bright yellow, five-petaled, with black dots. It is in flower from June to August. Useful components: Hypericin, hyperforin, flavonoids, tannins. Medicinal use: St John’s Wort is considered to be an anodyne, antibiotic, astringent, bactericide, cholagogue, diuretic, emmenagogue, expectorant, vermicide and vermifuge. Traditionally, the plant was used in treatment of menstrual disorders, as a wound healer, for external ulcers, respiratory and bladder conditions. 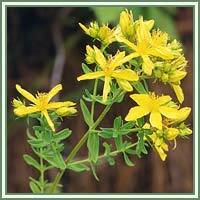 Nowadays, St John’s Wort is considered as a favorable remedy for different ailments: it helps the secretion of bile juices, it’s recommended as a mild sedative, and acts as a helpful remedy in treatments of stomach cancer, herpes, hemorrhoids, even as a mood-stabilizer and an anti-depressant. It inhibits bacterial and viral growth and helps in cases of bronchial, menstrual and digestive problems. Safety: St John’s Wort could interfere with some of the medication used in cases of HIV and immune suppressants used by patients with transplants. It is advisable to consult your doctor before consumption of any herb.